The original “90 Day Fiance” will return next month with a new batch of couples next month, including a wealthy Indonesian woman slumming it with a middle-class Wisconsinite, two separate accidental pregnancies and a 31-year-old desperate to make her third engagement stick. The hit TLC reality series follows couples who have 90 days to marry before their visa expires and one of them will be forced to return to their home country. The sixth season is set to premiere on Sunday, Oct. 21 at 8/7c. Read the full cast bios below. Kalani met Asuelu while she was on vacation in Samoa and Asuelu was working at the resort she was staying at. 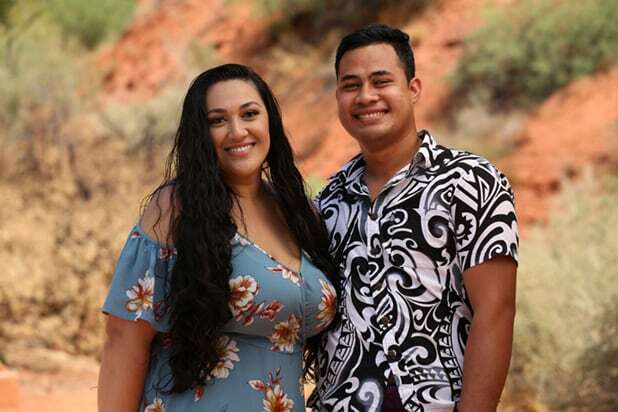 Kalani, raised Mormon and always taught to save herself before marriage, lost her virginity to Asuelu and got pregnant with his baby. Having to break this news to her family didn’t give them the best impression of Asuelu, especially her father who doesn’t trust him. Kalani’s sister also has an issue with him as Kalani hasn’t told her the full truth about their relationship. Now with a five-month-old and only 90 days to impress her family, Kalani and Asuelu must work to overcome the obstacles ahead of them. Divorced with three daughters, Eric met Leida after posting a personal ad on an international website. The two immediately clicked and spent much of their time video chatting until Eric was able to travel to meet Leida in Indonesia, who lives with her parents in a very wealthy and high-class neighborhood. After just two days, Eric proposed to Leida and now they are gearing up for her move to the U.S. Eric hopes that Leida and her son will help create a happy blended family along with his kids. But the age difference between them has Eric’s children concerned about Leida’s true intentions. In addition, Eric is fully aware that the life of luxury Leida is used to might make it challenging to adapt to his middle-class lifestyle. Jonathan and Fernanda met at a club in Mexico, leading Jonathan to extend his trip for an extra three days. He hadn’t expected to meet someone during his trip, so he shocked everyone, including himself, when he proposed after just three months. Jonathan has made the most of his bachelor lifestyle and must prepare for the big adjustment of sharing his life with someone else. Fernanda jokes that Jonathan is robbing her of her youth by tying her down at such a young age, but Jonathan sometimes wonders if their 12-year age difference could be the demise of their relationship. Ashley met Jay when she went to Jamaica for her friend’s wedding. While out with her girlfriends the two met at a club. Ashley didn’t expect to talk to him again, but Jay tracked her down on social media. Six months later, Ashley went back to visit, and after spending just eight days together, Jay proposed. Ashley has had two failed engagements, so she’s hoping the third time is a charm, but with Jay being so young and having had a wild lifestyle, she’s hoping he can be serious about their relationship so that she’ll finally be able to stop searching for long lasting love. Colt wasn’t having any luck with American women, so he decided to look elsewhere and met Brazilian bombshell Larissa via social media. Colt and Larissa both traveled to meet up in Mexico, and Colt proposed after just five days. Colt is a mama’s boy and is used to his mom taking care of him and everything he needs, so they both must make adjustments to fit Larissa into their everyday life. Colt worries that Larissa has the wrong impression of what it means to be American after all of her high-priced demands, and Colt’s family worries that Larissa is just using Colt for a ticket into the U.S. When Steven and Olga met on the beach, Olga was only in the U.S. for the summer and the two of them were just having fun. After just a month and a half, Olga became pregnant throwing them for a loop and changing what they thought would be just a summer romance. Once Olga arrived back home in Russia, the two discussed their plans moving forward and decided to get engaged and bring Olga to the U.S. in order to the raise the baby there. Steven’s father passed away when Steven was just seven years-old so he is determined to have a presence in his son’s life, and the young couple believes that obtaining a K-1 VISA is what they must do to be together. But will Olga’s VISA get approved before Steven has to return to the U.S.?